It's time for the Book Blogger Hop, hosted by Jennifer at Crazy for Books, again. 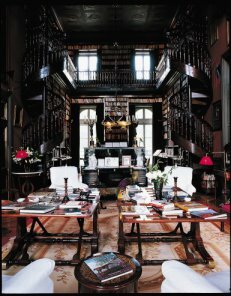 I would like to have the library from Professor Henry Higgins' house in the movie with Audrey Hepburn, My Fair Lady. I would love to have the spiral staircase going up to the second floor, and the rolling ladder to reach the high shelves. holy crap I WANT THAT LIBRARY. and you know what I really want? a damn maid to dust everything. how is it that books collect more dust than anything else in my fricken' apartment? Mean Streets, by Jim Butcher et. al.